Doctors at a South Korean hospital pronounce a young gamer dead on arrival after he collapsed at a local gaming center. A 19-year-old college student from Ulsan in South Korea, identified only by the surname "Moon," has died following an almost completely uninterrupted twelve-hour gaming session. Very little is known about the circumstances of Moon's death. He entered a local PC Bang - and internet cafÃ©/gaming center - at around 2AM, and then played for eight straight hours. He dashed home for a quick meal, and then returned at 10:30AM and continued playing. Sometime after that - presumably after 2.30PM - Moon collapsed, whereupon he was rushed to hospital. Sadly, doctors were unable to help him and he was pronounced dead on arrival. Moon's cause of death is still being investigated. 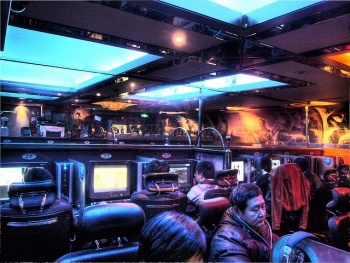 The New York Daily News suggests that videogame addiction is a serious problem in South Korea, and that the government has taken steps to try and rectify the problem, especially amongst children. Not only are underage gamers barred from playing online between midnight and 6AM, it is now apparently illegal to open a PC Bang within 200 meters of a school. Sadly, neither of those measures would have helped Moon. While the information is pretty thin, it's reasonable to assume that it was a perfect storm of events that led to this tragedy, rather than one single cause. Healthy 19 year-olds don't just keel over after a single all-nighter, so there must have been some other element to it that we don't know about. The Korean Times reports that Moon was a habitual visitor to the PC Bang, so it's quite possible that he pushed himself too hard and exhaustion took its toll.